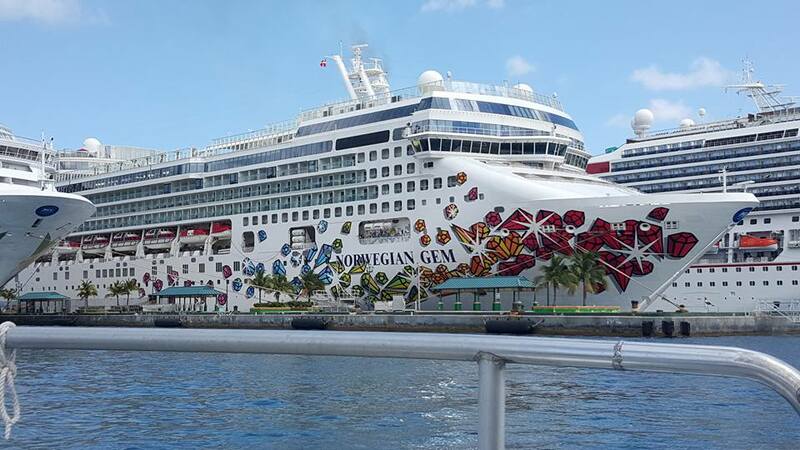 Norwegian Gem spent her initial season at her home port in Manhattan, sailing a variety of cruises to the Bahamas, Florida, and the Southern Caribbean. For Summer 2008 the ship was based in Barcelona, Spain operating 7-night cruises to various Mediterranean destinations. During winter 2009, the ship was doing a series of 7-day Bahamas/Florida cruises, and then consecutive 1-night cruises. From April 2011 to October 2011, the ship will begin sailing on Sundays on a 7-day cruise from New York City to Bermuda service to replace the slightly smaller Norwegian Dawn. The Norwegian Gem will do 9 Day Eastern Caribbean cruise & a few 10 Day Canada/New England cruise to Quebec in New York. In 2013, Norwegian Gem will continue 9-day Caribbean sailings and 7-day Bahama & Florida sailings. Norwegian Breakaway will replace her Bermuda sailings starting in May 2013. As of October 10 of 2013 is anchored at Drydock Boston, Ma. In 2014, Norwegian Gem has 9-day Caribbean sailings, 7-day Canada/New England sailings, 1-day and 2-day New York sailings, etc. She is currently sailing from New York to the Eastern Caribbean, to the Bahamas from New York, and Southern Caribbean from San Juan. On January 5, 2010, the vessel reported propulsion problems resulting in a temporarily power loss and an itinerary change (call port San Juan Puerto Rico was skipped). On the next cruise (also Caribbean roundtrip from homeport New York) the ship continued to experience problems with one of its Azipod units. Passengers reported constant listing to starboard and vibrations for 5 days until the ship arrived in call port Charlotte Amalie (St Thomas, USVI), where the propulsion unit was fixed. April 29, 2015, while en-route from Nassau Bahamas to New York, the ship detoured to assist in a search and rescue operation conducted by two Royal Caribbean ships, Enchantment of the Seas and Quantum of the Seas. They were searching for a seaman who fell overboard from his yacht. Soon the cruise vessels were joined by an USCG helicopter. After 1 hour of aerial search, the man was found and successfully rescued. May 17, 2015, a 10-year-old girl drowned in a swimming pool on Lido Deck 12. The kid was found by other passengers face-down in the water and unresponsive. Some of the passengers on the pool deck were medical doctors and nurses. They immediately started working on the girl poolside until the ship’s med team arrived on the scene. The administered CPR procedures failed to revive her. When the accident occurred, the ship was 130 km east of Myrtle Beach SC. December 14, 2009, 7 passengers sustained injuries in a bus crash accident on a sponsored by NCL shore excursion in Port Canaveral Florida. At 2 pm, the tour bus with all 43 passengers and crew was hit by a car on Merritt Island. The car driver was killed. January 27, 2013, a female passenger suffered appendicitis attack and was medevaced. The ship had to return back toward Puerto Rico to meet the USCG helicopter. The incident caused 3 hours late arrival in homeport NYC. March 26, 2014, the ship requested assistance for a male passenger in medical distress. The man was traveling on a honeymoon cruise with his newly-wed wife. He was medevaced at 5 pm by an USCG helicopter MH-60 Jayhawk sent from Elizabeth City, North Carolina. They met the ship ~80 ml / 290 km off the North Carolina’s coast, and transported the passenger to Albemarle Hospital (Elizabeth City). January 29, 2015, a 66-year-old female passenger suffered diabetes complications and had to be medevaced by an USCG helicopter. The ship was 220 ml / 350 km off the North Carolina coast. The woman was flown to Norfolk VA (Sentara Norfolk General Hospital). November 2013, CDC reported on the voyage Nov 16 to 25, a Norovirus outbreak (gastrointestinal illness) infected 111 passengers and 3 crew. All sick suffered from Norovirus symptoms (vomiting, diarrhea) and were quarantined to their cabins. March 2016, during the 10-day Eastern Caribbean cruise round-trip from NYC New York, the ship reported around 2% of its passengers suffering from Norovirus symptoms. Due to the infection risk, the ship was denied berthing at the scheduled call port Philipsburg (St Maarten) on March 18. Later, CDC issued an official report, according to which the virus outbreak infected 128 passengers of and 7 crew.